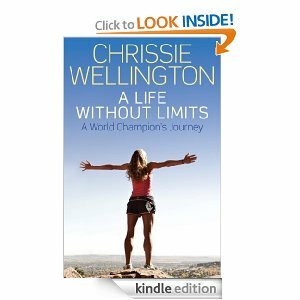 For March's blogger bookclub (running and triathlon focused) we read Chrissie Wellington's book, A Life without Limits. I, once again, read this book on my kindle (gosh, I love that thing!) and so this is just the image that I see on my purchase history on amazon, I don't actually get to see it for real. Like the Ironman book that we read previously, I was not sure how I was going to feel about this one. I am not a triathlete as of this point. I cannot even work up the nerve to do one of the indoor ones that they have around here on a fairly regular basis. I would only need to swim for about 15 minutes, but I am still afraid to do it. And with the indoor ones, I could do it now before I have a bike (and know that I would WANT to do it again before I spend the money on a bike). But I was definitely pleasantly surprised and inspired with this book. The book examines Chrissie Wellington - a 4 time Ironman World Champion in Kona. We look at her early life, and how she was always athletic, but a little bit clumsy as a kid, so she was never necessarily AWESOME at anything. We examine her struggle with bulimia, which eventually morphed into anorexia. Her life as an athlete helped her to conquer that horrible addiction though. We watch her travel as a young woman and take interest in new things, running and cycling (swimming was the sport that she had always participated in) while she is starting out her career helping others and working in Sustainable Development. This allowed her to see much of the world and learn about how things worked in impoverished countries and be outside of the UK. Learning about the sport of triathlon really started speaking to her, and eventually she chose to leave her job in order to become a professional athlete. She had a coach (Brett Sutton) and he was determined to get her to leave behind her desire to be an Olympic distance triathlete, and move into the Ironman distance. After Chrissie had her first taste of Ironman (watching some friends and teammates compete) she was stuck. This was what she wanted to do. Her first Ironman was Ironman Korea in 2007, which she won (and sent her on to Kona) and from that point, this would be her main focus. She won the Ironman Kona on her first try, and became the World Champion. Since then, she has won it 3 other times. Chrissie spends a lot of time in this book reflecting on the mental aspect of racing, which has certainly always been more of a struggle for me than the physical. I mean, I get the training, I do the work, but sometimes my head just isn't there. She actually walks us through a lot of her thoughts as she starts a race and even in the week leading up to the race. I think that I might try to do a little bit more of the mental training that she spends doing, and maybe then when I get to the point where I am ready to train for a big endurance event again (next spring, I hope?) my mental state will be much stronger and more ready to tackle my big goals (definitely a problem in Columbus). This book really started putting the bug in my ear again. It is a bug that has come in and out, depending on what state of training I am in for a race. But right now, I am spending a lot of time thinking about triathlons. Did this book make you want to try for an Ironman? It certainly does to me! I'm glad you enjoyed the book! As you probably already know, the Ironman is my husband's and my ultimate goal so I was definitely inspired!